Cute vintage 70s pendant necklace from Avon. Silver tone metal with brushed textured front. Metal links on chain. chain length is 60cm. Excellent vintage condition. Will be posted second class recorded delivery. TWO. 925 SILVER CHAINS. Both chains have ring fastenings. 45 cms pendant chain drop (49 cms overall). The bail of the pendant is actually a very very light gold colour which is closer to silver than gold, hence why I've put it on a silver coloured chain. There's a few scratches to the pendant from use. A simple yet very pretty little piece. Signed "AJH" and "SILVER" to the back of the brooch. Reg: 1515 Silver & Gold Tone Texture Leaf Brooch. I like to imagine where that piece of jewellery has been worn and by who. This is a nice original Victorian sterling silver engraved stick pin. JEWELLERY IS CLEANED AND READY TO WEAR UNLESS THE AGE OF THE PIECE WARRANTS IT BEING LEFT ALONE. These have been cleaned and disinfected ready to be worn again. BEAUTIFUL AND UNUSUAL SCOTTISH AGATE SILVER KILT TIE PIN. The pin itself is in excellent condition for it's age probably coming from the early 20th century. WEIGHT: 1.3 grams. The back of the brooch is largely smooth and un-decorated apart from a subtle decoration on the two sides leading up to the top of the triangle. The reverse of the brooch also bear the words 'Jerusalem' and 'Silver' fairly close to each other. VINTAGE 80'S 3 STRAND FANCY S LINK SILVER TONE NECKLACE 20"
LOVELY QUALITY 3 STRAND S LINK NECKLACE. LARGE BOLT RING CLASP. SILVER TONE. THEY CAN BE OR ARE SUPER SIZED SO NOTHING IS HIDDEN. APPROX 20". NICE WEIGHT TO IT. Gorgeous Large Siam Silver Circular Dragon Boat Brooch. The back of the brooch is stamped 'Siam Sterling'. I like to imagine where that piece of jewellery has been worn and by who. JEWELLERY IS CLEANED AND READY TO WEAR UNLESS THE AGE OF THE PIECE WARRANTS IT BEING LEFT ALONE. This is a great pair of sterling silver large hoop earrings. An unusual brass swirly brooch mount with a 1967 British half penny coin. Materials: Brass or similar/half penny coin. It was first designed in the 1930s but we think this may be a later version, possibly from around the 1950s - 1960s, although it may indeed be from the 30s. Signed Fahrner TF 925. I like to imagine where that piece of jewellery has been worn and by who. JEWELLERY IS CLEANED AND READY TO WEAR UNLESS THE AGE OF THE PIECE WARRANTS IT BEING LEFT ALONE. This is a Striking handcrafted sterling silver ring in an unusual and interesting square design with internal scrolls. Vintage Beautiful Art Deco Necklace, Silver tone. Stunning Art deco Necklace, very Chic. SECURING WITH A ROLLOVER CLASP. 1920s TO 1930s. THREE SETS OF SILVER CLIP ON EARRINGS. ALL EARRINGS TESTED AS SILVER. SMALL BROWN STONES IN MIDDLE. NICED USED CONDITION. PAIR WEIGH 13.6 GRAMS. SET 3 2.1cm BY 1.9cm OVAL SHAPED. THE SPHERES ARE HOLLOW SO NICE AND LIGHT TO WEAR. FUN SPHERE DESIGN DROP EARRINGS. IN GREAT UNWORN CONDITION. THEY CAN BE OR ARE SUPER SIZED SO NOTHING IS HIDDEN. 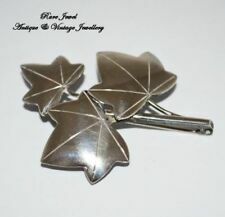 Featuring separate sections of patterned and brushed silver tone half star like designs with an adjustable chain clasp for the perfect fit. Beautiful wreath design running through the centre of the brooch. Condition : Great condition - stamped on the back Ecco and STER. If other options are available, they are listed. This is a gorgeous new and unused piece of Hand Crafted Irish Jewelry by Kieran Cunningham. Vintage silver 925 marcasite ring size P 1/2. The widest point measures 2.5cm Thanks for looking, any offers are welcome I can combine postage. Fasten with a clip on style fastening on to the ear that hinges but also has a screw to tighten to fasten more securely. Used but in good general condition, are quite a dull silver colour but may clean up, I have left as is. Silver tone snake chain with inter connected rings pendant. The necklace is used and in a very good condition. Vintage c1970s hallmarked in Birmingham, imported, triple strand, link silver necklace. 16in. Perfect for that something old at your wedding. We have a wide range of antique and vintage items in our shop and will be happy to combine shipping costs. Please take a look at our other items. About us Classic Brocante is a husband and wife team, Franc and Karen Jackson. We are based in Rugby, England, which is conveniently situated for both UK and European travel. Classic Brocante sources, buys and sells vintage, antique and unusual items including jewellery, kitchenalia, collectables, curios and bric-a-brac. We pride ourselves on delivering high-quality items to buyers around the world and ensuring that our listings are as accurate as possible. A thick and fairly weighty 925 sterling silver ring with almost half the ring pave set with clear stones. Inside the band is marked 925 and there's a makers mark of "TC" within a crown shape. I don't think that this has lots of age to it. EMMONS JEWELERS, INC., Newark, NY -- founded by Charles H. Stuart -- Feb. 1949-- March 1981. Emmons bought designs which they & other producers manufactured. A lovely and essential addition to any collection, ready to wear with a lovely dress and your favourite heels, or even a casual outfit. Heavy and seems well made is signed to the reverse ‘Monet’. These are prettily detailed finishing in a point at one side and the one loop sits just beneath the other in a lovely elegant swirl. This bracelet also has a safety chain. A fine pair of silver coloured cufflinks with embossed and etched decoration. Filigree Ornate Circular Brooch. Beautifully crafted little silver filigree brooch with lots of detailing. Vintage Sterling Silver Scottish Celtic Brooch By John Fraser. Hallmark with thistle , castle , date letter K and initials J,F, Approx 5.5cm /2.2 inches in diameter.Good condition. Beautiful piece of jewellery.. Dispatched with Royal Mail 1st Class Large Letter.